This quest is not available if you sided with the Volkihar, or if you are currently a vampire. With the Dragonborn add-on, if the item happens to be found on Solstheim, there will be no quest marker. Travelling to Solstheim will make the marker appear in the relevant location. The rewards of this quest may trigger Calcelmo's quest Buy Dwarven artifact. Sorine may request that you retrieve a recipe again. 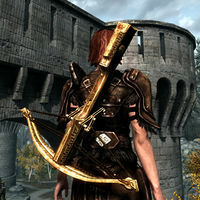 For example the Enhanced Crossbow Schematic from Broken Helm Hollow and then later from Hrodulf's House. 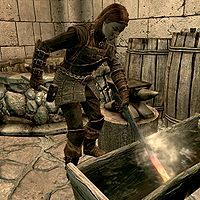 Simply get the item again although it results in no new smithing capacity. ?